Home Development Opinion: Could Library Building Be Option for Public Radio Move? If public libraries never existed in the United States their concept would baffle most people if proposed today: a 100% free and public space where tax dollars purchase and provide books, magazines, music, videos, technology, and other community services at zero cost to the individual. The public library has been a grand achievement in providing access to knowledge and services in this country, and the Public Library of Cincinnati & Hamilton County is no exception. Our local library system is the 3rd largest publicly run library in the country, and the 15th largest when including university library systems. It is also the largest public library run at the county level with Boston and New York running city level systems. For perspective, Hamilton County’s library holdings are 52% larger than Chicago’s and more than double that of Cleveland, Seattle, Miami, and the state of Hawaii’s systems. Like most public libraries, Hamilton County’s has undergone dramatic changes in services offered in the past decades due to the explosion in digital media and internet resources. While libraries still contain substantial physical holdings, most new resources are digital and require less space. The Main Library branch in downtown Cincinnati was expanded in the 1990’s with the construction of the North Building, as the South Building was too full to hold new books and physical materials. According to the Public Library Board, the changes experienced by libraries over the past decades have rendered the North Building’s space unnecessary for current usage. Their reports suggest that the South Building could accommodate what the North Building houses today. In 2016 and early 2017, the Board considered selling the building and underlying land to reduce its footprint and provide funds for branch renovations countywide. The Cincinnati Center City Development Corporation, better known as 3CDC, had been involved in advising potential futures for the building and the site. Protests followed this news, and the outcry pushed the Board to retain the property while finding new uses for the building. This keeps the land public, alleviating concerns of those fearing a privatization of public assets in an era of dwindling public resources. To fund branch renovations the Board instead placed a 1-mill tax levy on the May 2018 ballot, which passed 63%-37%. So what to do with the North Building? Aside from demolition the building, its redevelopment potential is restricted due to the high ceilings and massive floorplates which were necessary to hold the weight of hundreds of thousands of books. Meanwhile, Cincinnati Public Radio (CPR), the license holder of WVXU, WMUB, and WGUC is looking to move. CPR’s current space in the CET Building and garage at 1223 Central Pkwy behind Music Hall has been rumored to be redeveloped in the near future, due to its proximity to the future FCC Stadium and the deteriorating condition of its public parking garage. CPR has proposed siting its new facility near city hall, at 9th and Plum, a block that Indianapolis developer Milhaus has expressed interest in constructing apartments on since 2016. Why fight over one parking lot when there are plenty of other options to pursue? There is one option that would give CPR a new space and potentially satisfy the repositioning of the Library’s North Building: Move CPR to the North Building. CPR needs large spaces for their studios and equipment, as well as office space. While they may not entirely fill the North Building, they could anchor a new era in the life of this critical public space in the region’s core. Ideas for the remaining space could include a museum on public radio and public libraries which could accompany CPR, as well as other public uses. There could be a news ticker that wraps around the building fronting on Vine and 9th Streets, giving updates to downtown residents, workers, and visitors. 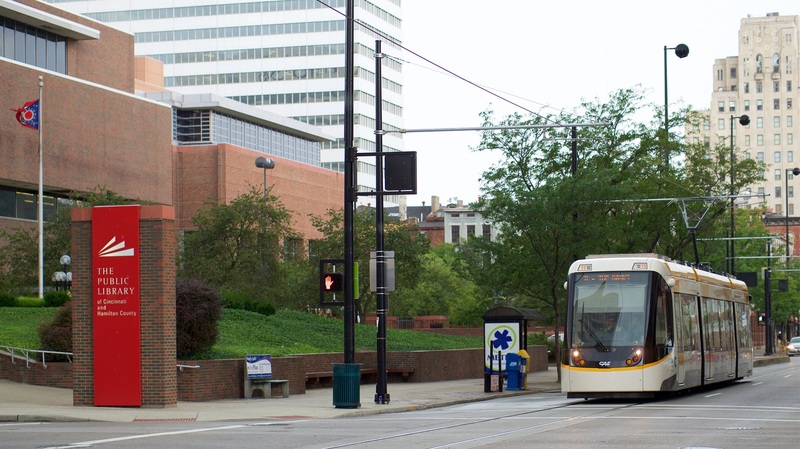 As UrbanCincy previously explored, this area of downtown can be a reactivated with more residential housing. More residents help drive the vibrancy of the core and will help activate retail storefronts already in the area. Despite having city departments, Pure Romance, and other office users, retail activation still lags in this part of the neighborhood that has seen generations of demolition for parking. A move to the North Building for CPR could potentially reactivate 9th street, be close the Cincinnati Streetcar and keep the space public. Likewise, continued residential development in the northwest quadrant of downtown will strengthen and reconnect that area of downtown to Over-the-Rhine and the new FC Cincinnati Stadium. Seems like this could be a win-win for everyone.